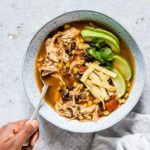 Wake up to a delicious healthy egg dish with this Instant Pot Chicken Tortilla Soup. Add all ingredients to the IP insert starting with chicken stock and add beans and corn last. Don't mix. Select the manual or pressure cook button (dependent upon IP model), select high pressure and set the timer to 8 mins. When done let the steam release naturally, open and remove the chicken from the pot. Shred chicken with a fork and add back in to the Instant Pot and mix. Serve your chicken tortilla soup with topping of your choice. It’s important to add the chicken stock first. Add beans and corn last and don’t mix together. You can add more spice if you’d like but also eliminate completely. Top your pressure cooker chicken tortilla soup with “Corn Tortillas.” These are Vegan and Gluten-Free. Serve with some guacamole and / or sour cream. Add in some Instant Pot Brown Rice to bulk it out. There are 4 Freestyle points per serving of Instant Pot Chicken Tortilla Soup.